Balanced preamplifier design housed inside a low profile, compact, ultra-low resonance, structurally rigid chassis that is precision-machined from solid blocks of aircraft grade 6061-T6 aluminum that is completely sealed for trouble-free operation and high RF and EMI isolation. Features an elegant front panel precision-machined and sculpted with a diamond tipped cutting tool. Low noise, high-current, dual regulated switch- mode auto sensing and auto ranging power supply provides Capri with optimum performance at any world-wide mains operating voltage. Transformer coupled input circuitry provides universal component compatibility and virtually eliminate ground loop noise and RFI/EMI. Transformer coupling ensures identical preamplifier overall gain when using unbalanced input adapters. Other benefits include ground noise isolation and excellent common mode noise rejection (CMRR) from all sources. 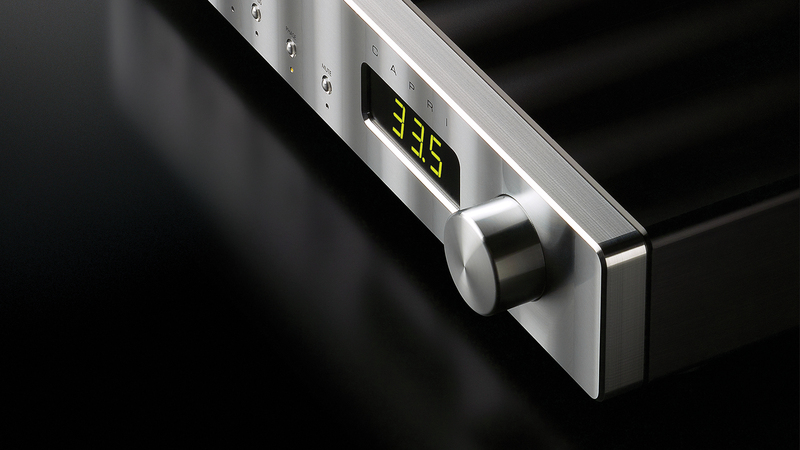 Dual low impedance line-level outputs (80 Ohms balanced, 40 Ohms unbalanced), 48 Ohms balanced and unbalanced inputs, and preamp bypass inputs allow unprecedented compatibility with audio and A/V components, while optional high quality phono cards are available for compatibility with vinyl sources. Six-function remote control transmitter display dim, adjusts volume, input selection, mute, phase, and channel balance. Dual rate volume control allows precision level adjustments over nearly a 100 dB range. The volume control incorporates a permanently noiseless optical encoder that always maintain its tactile feel, accuracy, and channel balance at all settings. The optical encoder mounted behind the volume knob commands the attenuation level of a monolithic resistor attenuator over a 99.5 dB range in 0.5 dB increments. Plug-in phono cards (installed internally) converts Line Input 1 to high performance phono input. Three gain and loading options can accommodate moving magnet (MM), moving coil (MC), and high output moving coil cartridge types. Plug-in DAC card (installed internally) converts Line Input 1 to high performance DAC input. 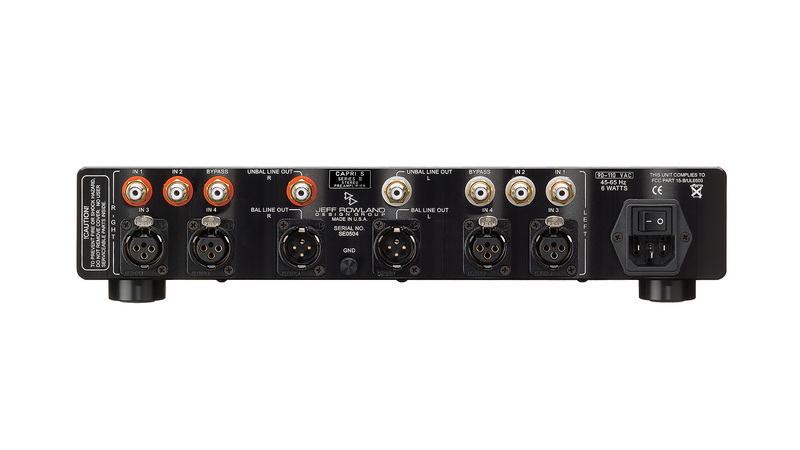 Accepts all SPDIF digital signal sources from 44.1 to 192 kHz sampling rates and adjusts accordingly. The Home Theatre BYPASS RCA inputs can be changed to an additional set of standard inputs by placement of an internal jumper inside the unit. An internal jumper will place the display in an automatic OFF condition after 5 seconds from any operational command and illuminates again for 5 seconds after additional commands are initiated. All signal connectors are rhodium plated, copper jacks (RCA) and Neutrix silver plated contact (XLR), soldered directly to the circuit board for direct connection to the signal circuitry. Modest power consumption of mere 6 Watts permits constant power-up operation to eliminate warm-up time and maximize musical performance, and allows Capri to operate enclosed into an entertainment unit.